Lumenus, The Best Way To Cycle At Night! Morever, we emphasize design in our software, hardware and how you, the user, interact with your garment seamlessly through human centered design. Join the military movement without having to sign up. The power of the AfterShokz brand lies in a single key concept: be open. Yes, we're talking about headphones here. It's about your safety. It's about serious comfort. And, most importantly, staying connected—from your music to your moments—without compromise. 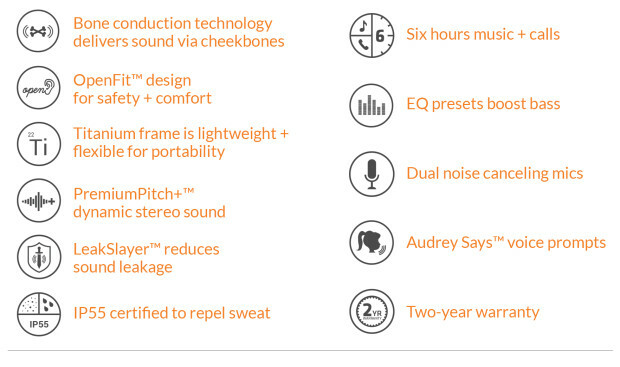 Behind this incredible open ear listening experience is our patented bone conduction technology. We've been in this business for years now. We know the benefits and we're all too familiar with the challenges. That's why we're confident in saying we've mastered the solution to bring you powerful, dynamic audio without the traditional limitations. New Watch, Helgray Hornet - All-Around Badass Watch with Dual Time Zone! The Hornet is as rugged as it gets. The solid stainless steel case can take a beating. Good luck trying to scratch the double-domed sapphire crystal. The Japanese quartz movement requires virtually no maintenance - because you have better things to do than wind your watch everyday. And the Hornet is certainly not afraid of water - go ahead and dive of a cliff if you dare. Keep it Down! Orange Screw! SlowTwitch kills it again with their review of the newest stuff coming into 2016! The tri bike landscape is shifting. I hope that's clear. Companies are making some very fast framesets and by that I mean frames, forks, seat posts and brakes, though sometimes that means brakes you have to buy and retrofit to the bike to bring out the frame's best performance. But that's kind of fun in a way. We don't make motorcycles, where what you buy is pretty much what you ride. We make bicycles, and they are made to be fiddled with. I'm excited by the new generation of tri bikes but I am also frustrated waiting for the aftermarket to catch up. Can I list both the products that I can't find, that somebody ought to make, as well as further frame ideas sitting out there waiting to be developed? Riviera, SUP or Surf, why decide. At 10'6" the board is perfect for small to large surf. One big thing is make sure you are back far enough on the board not to nose dive. The Riviera 10'6" is a perfect board for first time paddlers. Very stable cruiser that comes with traction, and a built in handle for carrying. Ideal for touring & surfs well. It has a slightly pulled in nose and pinched rails for better maneuverability in the surf. It has a 2 + 1 setup that give you the options for different paddling conditions. We provide the highest quality Stand Up Paddle boards available from Ron House, Timmy Patterson, Jeff Clark, and our signature line, Riviera. Whether you are a beginner, novice or expert, we have a stand up paddleboard to suit your needs. We also manufacture Riviera SUP Paddles, Apparel, and Accessories. Our selection of high performance stand up paddle boards are made of hand finished EPS core foam and glassed with Hexel Fiberglass, and Resin Research Epoxy resin. This method of construction provides the custom made look that has been traditional in the surf culture for decades, as well as the best response, glide, and maneuverability of any stand up paddle board on the market. All boards have a built in handle and integrated deck pad. I used to use a outdoor pressurized sprayer you find in any Home Depot. it was roughly about $40 and worked great. Now the RinseKit has a head like a shower that you can pick 6 settings. That's kind of worth it, but $50 more I'm not quite sure. With no pumping and no batteries, RinseKit delivers a pressurized spray for up to three minutes. RinseKit stores the strength of a regular household spigot or sink (with adapter) and can be quickly filled with hot or cold water. RinseKit’s patented design features the eon™ pressure system that holds up to 2 gallons of water with a spray nozzle that offers seven different settings from jet stream to soaking shower. It comes packed with thoughtful features, including: compact design with a 2 gallon pressure chamber, built-in ruler to measure fish, folding handle for one-handed carrying, and easy-to-remove lid to stand on for changing. The RinseKit comes with a Hose Nozzle, 6′ Hose, Hose Bib Adapter, On/Off Valve, and Quick Connect. 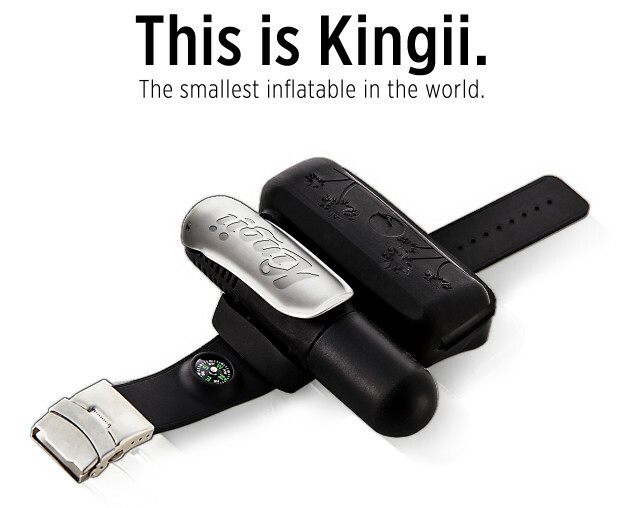 Kingii, Smallest Inflatable In The World! Kingii is small, non-invasive, reliable and with it's unobtrusive design for the first time providing safety in the water in a convenient way. The Kingii fits on your wrist, stays out of the way, is rechargeable and is there when you need it most. The smallest inflatable in the world is perfect for every activity, every age and every environment around the water. The risk of drowning and the need for bulky safety devices is over! The only thing that would make this better is it you could set the depth and not require the use to pull a tab. Parents - you worry about your kids but want them to be independent and have fun in the water. In situations when you can not be present, Kingii provides that added safety net that allows you to worry less. Give your child something that it likes to wear and that is easy to use. Simple things make life that much better. I hate carrying around my camera, because of the neck strap. Everyone, pulls out their phone and snaps a picture. Peak Design has changed that and this belt/strap click is awesome. The CapturePRO® Camera Clip is our flagship, pro-quality camera carrying solution. Carry any camera on any backpack strap, belt or bag. All-aluminum, extra-durable construction. Compatible with multiple tripod types, and can be used as a tripod head itself. The difference between this CapturePRO Camera Clip and our previous model is the PROplate that comes pre-loaded. This CapturePRO comes with our new PROplate which combines the functionality of the three previous PROplates into one new PROplate. While supplies last, CapturePRO is available pre-loaded with our previous versions of PROplate (ARCA, DUAL, MICRO) for a reduced price of $64.95. Ships FREE & FAST just about anywhere in the world. See details. This has to be the hottest bike on the tour or in shops right now. I know they are using this for the cobblestones, but for the everyday rider on their local country roads this is a game changer. Wow, makes you want to sell your old GoPro. Again game changer and kept well under wraps. Who saw this coming? GoPro seems to be the only camera to buy and use. Why buy anything else, drop it, dunk it, freeze it, stuff it into your pocket, you can't go wrong with GoPro. 50% smaller and 40% lighter than other HERO4 cameras,1 HERO4 Session is the most wearable and mountable GoPro ever. With a sleek, versatile design, it’s at home anywhere—from the surf to the snow, to hanging with friends.HERO4 Session features SuperView™, a GoPro-exclusive video mode that captures the world’s most immersive wide-angle field of view. It allows you to capture more of yourself and your surroundings in the shot—resulting in captivating, ultra engaging footage of every adventure. $400 for a rain jacket. Not sure how many they will sell, but check out the review given by Outside magazine. The aesthetics didn’t appeal to everyone. Columbia is using contrasting external seam taping and contrasting patches on the shoulders. This makes the jacket look techy, but it’s a look that not everyone loved. A jacket best suited for people looking to do high-output activities—think hiking, trail work, or flatwater paddling—in the rain. SeaWolf - Submarine For Your GoPro! Being safe is not just looking out for danger it is preparing for it before it happens. This guy in Switzerland fell into a Crevasse and had the right equipment and friend to get him out. The big thing and one of the smallest pieces of equipment that he had was an ice screw with webbing attached. He crewed it in and was safe from falling any further. I can tell you for $60 this is one piece of equipment that will be going into my bag. Be safe al the time and know the conditions before you go out. Amazing, another game changer. Lily is not the first one of its kind but it is waterproof so that makes it a leader. Plus it has the camera built in, GoPro that is a tough act to follow, $399 for a GoPro or a preorder of $499 for the Lily, ouch. HEXO+ is another camera but it pricey and you have to have a camera to capture video. If this is the way it is heading I would be surprised if GoPro does not come to market with one in the very near future. The only problem I see is that I have to have a tracking device, why not just use your mobile phone? Many companies have missed the changed in consumer patterns and have never recovered, I hope GoPro can make the switch. Keen's Original Water Shoe, Tiger Stripes! Keen had a hit over ten years ago with their water shoe. I tried them out for sailing and it has to this day been the best sailing shoes I have ever owned. I talking about sailboat racing here, foredeck work, wet all the time and doing maneuvers on a deck that would normally be tough to crawl on let alone walk. I have been through Top Siders since theses were the only shoes available when I was a kids, they seemed to have lost their way, great looking, but don't seem to stick like I want them too. Well it seems as though Keen never went away, I guess when you are satisfied with the originals and they still work, why look for any thing different. Well it seems as though they have the Clearwater CNX a lighter more improved from the original. "The essential KEEN fit and protection lightened up to make every step a natural connection. The Clearwater CNX features a webbing upper with traditional KEEN sandal style. The bungee lace allows for customized fit. Multi-directional flex grooves on the low-profile sole enhance the natural flexibility of the foot and improve ground contact while razor siping provides advanced traction on slick surfaces. The contoured arch supports the foot." This one is made for sailing and paddling. When it gets wet and cold this is my next shoe. Now the "O" which I will call them were perfect, where them on the boat where them off the boat, perfect. These could however be my next sailing shoe. I love watches the bigger looking the better, plus they need to be bullet proof. Bell & Ross has proven that over and over again, Desert Type is no exception. @ $4200 it is a bit steep but you will never need to replace it. The latest addition to Bell & Ross's popular BR 03 lineup is a new stainless steel limited edition called the Desert Type. The sandy beige dial has a nice contrast against the black PVD coated case which is sized at 42mm, a much more wearable size in comparison to its much larger 46mm siblings. The watch also features an automatic movement, hour/minute/second/date functions, applied photo luminescent numerals/indexes/hands, sapphire crystal with anti-reflective coating, and two strap choices: aged leather and synthetic fabric. Already sold out. Designer are producing great stuff. The Torch T2 is a perfect bike helmet for those who commute, live in a city or just going into town. It also has blinking red lights on the rear of the helmet as well. Following the heritage of the T1, the T2 is the latest in cycling tech for urban commuters. It not only includes 10 integrated LED lights, but two rechargeable batteries offering up to 36 hours of continued use in a weather resistant design for safe riding in any type of weather, day or night! The T2 helmet is fully CPSC and CE certified. We will also be using the funds of this campaign to test for the AS/NZS standards so that it will become available to the Australian market in 2015. The T2 lighting system is protected by shatter-proof polycarbonate lenses. The lenses not only protect the LED lights from damage, but act as a diffuser making the rider just as visible from the side as the front or rear. The lenses also happen to be an integral part of the impact structure of the helmet's front and rear. 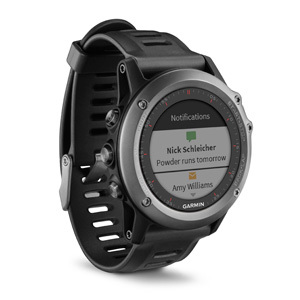 Garmin has a lot of ground to cover and the price is not going to help them. The good news is that there is another player in the market and they understand the playground. If nothing else this makes the market a little more choosy and hopefully easier to get into. Garmin is a trusted brand for many watches and GPS devices, so if the quality and care is put into the VIRB then you can bet that this will be a outstanding device. 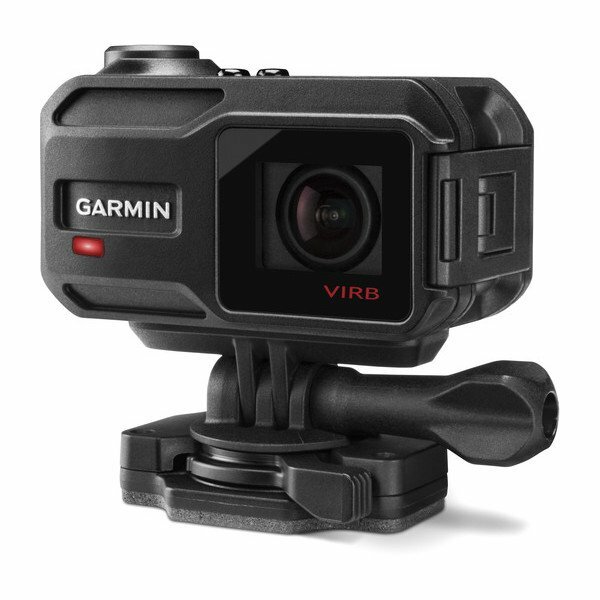 VIRB XE is the only HD action camera with G-Metrix™. So not only does it shoot rich, high definition video at 1080p60fps, it captures even more detail with G-Metrix sensors. Powered by Garmin GPS, G-Metrix allows you to track and overlay how fast, how far, how high, and how intense the action truly was. These watches are monsters, big, powerful and bullet proof, not that anyone would like to test that theory. Citizen has been making dive watches for awhile and they always are big and bad. Now with Eco-Drive, well no winding or batteries, perfect. Ready, Set, Dive. CITIZEN® Promaster Aqualand 200 Depth Meter watch with 70M depth display, ISO compliant, 8h pusher maximum depth and 10h pusher reset, power reserve indicator and auto start dive mode you won't want anything else when headed to the ocean. Stainless steel case compliment the black polyurethane strap and black dial. I love new cool stuff, especially when it changed the way you look at things. Camping for instance, the Amok Draumr is one of those changes. The presidental suite to nature´s own hotel, including an outstanding view. Wanna sleep with nature? Come hang with us! Amok Equipment is an outdoor equipment company that redefines the way people camp.After being sold out to over 15 countries, the patent pending hammock, Draumr has now reached its second generation. The idea behind Draumr was to create an adjustable bed you can take anywhere. Draumr is customized for outdoor sleeping and camping and it's only requirement is nature itself. Its adjustability quickly turns it into a recliner, bug free area or a flat bed, with or without tarp. the second generation of our patent pending hammock comes in colors blue and green. Suspension and bug net included. Available with and without tarp. The hammock requires an inflatable sleeping pad - you can read about size recommendations here. As things get smaller and more functional its only a matter of time till everything melts together. Or things that make sense. Meet Fogo, the only gadget that includes GPS, bluetooth, digital voice messaging, USB backup battery, and a powerful LED flashlight. Whether you're biking or hiking, fishing or hunting, navigating or camping, the Fogo keeps you safe and lightens your load! The Fogo was built to get you off the beaten path and keep you safe while exploring. With GPS tracking and waypoint navigation, the Fogo can be your guide as you blaze a new trail. Load points of interest from your smartphone via Bluetooth or USB and see everything the outdoors has to offer you, while the built in pedometer keeps track of every step you take. When you get there, communicate with other Fogo users via text or voice messaging. Don't worry if the real world comes calling, the Fogo has enough power to recharge your phone and still light the way home with its 1000 lumen flashlight. Get Cozier, Sleeping Bag For Two! This is so for me, a larger sleeping bag like I am at home. Now this is great for car camping or if you have someone else you want to share the night with. It is not down, but hey if there is someone else in there with you, why would you need down. You asked for it - and we built it. Now you can "sleep" in the wild like you do at home, with a comforter…and a special someone. Plus, it's available in this synthetic fill build, offering performance in warmer conditions. With an oversized, integrated comforter sealing the opening, you can "sleep" comfortably and naturally on your back, side, or stomach. INDOBOARD, Best Low Tech Gear, Ever! One of the best workouts you can get coupled with curls, push-ups, squats, etc., is with the Indo Board. The Original Training Package provides a complete workout without taking up a lot of space and offers hours of fun for riders of all ages and abilities. Indo Board was designed to enable the rider to have fun while exercising the core muscles involved in board sports, team sports and fitness. 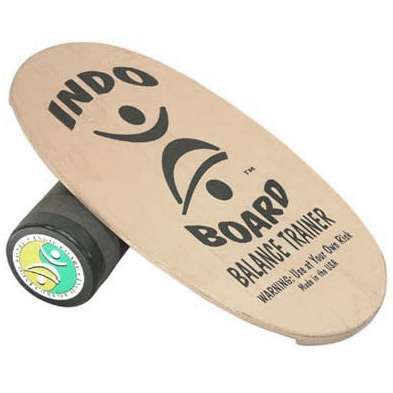 The basic goal of the Indo Board Balance Trainer with the roller and cushion is to ride as long as possible while keeping the board from touching the ground. The Original Training Package comes with both the original roller and the mouth inflatable IndoFLO: Balance Cushion that is great for Sports Training, Rehab and Therapy by promoting core training and core stability on a unique balance training device used by professional athletes worldwide. The workout possibilities are practically endless with the Indo Original Training Package as new exercises are constantly being explored and developed by our team of Group Fitness Instructors. The Indo Board Original deck does not actively roll on the cushion, it simply tilts offering a full 360; circle of instability that is challenging in a way that's safe and fun. Best of all, there is no risk of falling and no learning curve insuring that anyone can now enjoy the benefits and fun of balance training anywhere.The Indo FLO cushion is a safe product that has a multitude of potential applications and can deliver an interesting, full-body workout, whose uses have been refined based on expert feedback. The Indo FLO cushion was designed so anyone, regardless of skill level or age, can enjoy the benefits of core training while improving their balance, posture, coordination, and leg strength. AVADE, Heating Shirt, Perfect For Any Cold Weather Activity! With a passion for dirt bikes, an obsession with comfort, and a love of adventure : Ride. Board. Walk. Fish, AVADE was started because of our own need for a LIGHTWEIGHT and fast acting, heated garment that could compliment an existing active apparel, not replace it. We strove to build that perfect outfit, that feeling of unison between man and machine, tool or apparel, that feeling you get when everything works together and creates that harmonious flow. Preparation and setup was paramount. We wanted everything to fit and feel perfect, always thinking and researching new ideas. Do we just buy something that was adequate, or do we build a garment that was perfect for our multitude of uses. Constantly altering and adjusting. Originally it was the dirt bike and enduro riding that brought about the idea of a heated garment, keeping warm during those cool down times without overheating everywhere else. Then it soon took over our lives. It needed to work for our fishing trips and mountain biking weekends...golf, weekend sport spectating... the list went on. It had to be right for all, not just perfect for one. AVADE has been designed to be incredibly lightweight, thoughtfully engineered and supply warmth quickly at the PUSH of a button. Created for those start-up and cool down times, rest periods and transport sections. Using a minimalistic approach in an ultra light-weight garment, synthetic fibres for strength and flexibility, naturally occurring vapour release and Zero thermal benefits. Incorporating strategically placed carbon fibre heating zones, that balance heat, safety and battery life in a package that delivers maximum heat fast, on demand. smrtGRiPS are the World's First Connected Bike Grips. A bike upgrade that makes your bike smarter, safer and more enjoyable to ride without ever needing a display. These are brilliant, better for road bikes (coming soon I hope), but in general, just plain smart. smrtGRiPS seamlessly integrates eyes-free navigation, haptic feedback notifications and a bike tracker. iOS and Android Ready. All right in your hands. Pivotal Living, The Perfect Fitness Band! What makes this perfect, $12, that right, by now most everyone has heard of Pivotal Living. They are the company that turned the wearable market on it ear. In a couple months last year they made such and impact that it completely changed everyone's marketing strategy. $12 for a band, brilliant, well its $12 a year for their services. Smart, considering most people stop wearing them after a couple months. The interface and graphics are nice, there are some bugs but PL says they are working them out. To compensate all the early adopters they are giving users another year. So $12 for two years, again brilliant. The best thing is the sleep alarm, it gently vibrates you awake. Hey if you only wear it to sleep, a $12 alarm is a steal. New Year, New Gadgets, Garmin fēnix, Wear it All The Time! fēnix 3 is the rugged, capable and smart multisport training GPS watch. With feature sets for fitness training plus feature sets for outdoor navigation, fēnix 3 is ready for any training activity and competition. Access to theConnect IQ platform allows customization of watch faces, data fields, widgets and activities. And, fēnix 3 is a thin, light multisport training GPS that won’t slow you down whether for training or every day use. fēnix 3 is available in 3 bold models: gray with high-strength, scratch resistant, crystal and black band; silver with red band; and the premium sapphire model with a stainless steel band and sapphire lens. Each watch features a protective stainless steel bezel and buttons, and reinforced housing for extra durability. A sunlight-visible high-resolution color Chroma display with LED backlight lets you access your data in any light. fēnix 3 iswater rated 100 meters and has a battery life of up to 50 hours in UltraTrac mode, 16 hours in GPS mode and up to 3 months in watch mode (all depending on settings). The fēnix 3 isn’t just for running; special feature sets help swim training and skiing too. Borrowing from the Garmin Swim™, fēnix 3 tracks your distance, pace, stroke count and more. You just tell fēnix 3 the size of the pool you’re swimming in and begin your workout. Ski-board mode puts speed, distance, vertical drop and an automatic run counter (with Auto Pause for the lift line) and more at your fingertips. You can even use your fēnix 3 as a glove-friendly remote, via ANT+™, for the VIRB® and VIRB Elite action cameras. fēnix 3 uses the ConnectIQ platform for specialized software so you can personalize your watch with customized apps, widgets, data fields and unique watch faces that make your Garmin smartwatch even smarter. That about does it. Can't wait for my Polar to crap out, since the back is rusted might not be to long.